THIS IS A SEALED BID AUCTION. PLEASE READ THE PROCEDURES BELOW. The Asheville Regional Airport Authority (“Authority”) will accept sealed bids for the authority’s surplus property listed with this attached notice on March 2, 2011. Viewing will be from 9 a.m. until noon at the Maintenance Facility located at 15 Aviation Way off Airport Road, Fletcher, NC. Sealed bids will take place from noon until 3 p.m. at same facility. Winners will be notified by phone. The Authority reserves the right to reject any or all bids. The Authority also reserves the right to not be responsible for any property bid upon or received. Bidding is done entirely at your own risk. All items must be picked up no later than Friday, March 4, 2011 at noon. If you have not picked up your winning item(s), they will be disposed of. The Authority is not responsible for any property left on premises. Please be prepared to pay for items at time of pickup. For a complete listing of items, please click here. For additional information, contact Kellie Whittemore, IT Coordinator, 828.209.3740. Stepping through the security checkpoint at Asheville Regional Airport now not only means you’re that much closer to boarding your flight, but you’re also about twenty five steps from an incredible new restaurant, bar, and gift shop that opened just today at AVL. We knew this was going to be one of the most exciting airport enhancements in recent years, but as passengers and airport employees milled about the Blue Ridge Trading + Tavern in the post-security atrium this morning, the excitement was almost as tangible as the chocolate croissants in the bakery case. Or the Asheville apparel on the sale table. Or the 80+ magazine varieties spread out on the newsstand racks. You get the idea. And while the lattes could give any coffee shop a run for their money, and the lightweight travel duffels on sale for six to fifteen bucks are irresistible (one person was seen buying three of them), it’s really the variety of choices that have us all abuzz. Three paragraphs and we haven’t even touched on the bar and restaurant! The menu for the Blue Ridge Tavern features the work of a local chef; you may know him—Anthony Cerrato of Fiore’s Ristorante Toscana in downtown Asheville. The food—everything from sandwiches and salads to burgers and fried green tomatoes—is already receiving rave reviews, and you can pair your meal with a locally brewed beer, including selections from Asheville Brewing Co., French Broad Brewing Co., Highland Brewing Co., and Green Man Ales. Domestic and imported beer, wine, and mixed drinks are also available at the bar (which, if you haven’t heard, has a great wide-angle-lens view of the runway). Just as important as what’s on your plate is the atmosphere in which you’ll be enjoying your menu picks. A picture is worth a thousand words (see the snapshot below), but suffice it to say the combination of soothing earth tones, natural rock pillars, and overall upscale feel just might make you forget you’re in an airport at all. Good thing those final boarding calls can be heard in the Blue Ridge Tavern. We’re probably going to talk about this quite a bit throughout 2011 because we just can’t believe we’re celebrating 50 years. When the airport opened back in 1961, it was small but effective, and was a welcome addition to our community. In the years that followed, our airport got a few facelifts—upgrades, enhancements, expansions—and today it looks better than ever, if we do say so ourselves. But the best thing about turning 50 is the collection of memories compiled over the years. Famous visitors have graced us with their presence, from politicians to pop stars; hundreds of thousands of aircraft have come and gone, including the Concorde jet back in the 1980s, and Air Force One (and Two!) more than a few times; and, perhaps best of all, community support has grown as much as the airport has. It’s really an honor to have served the residents of Western North Carolina for five decades, and we want you to know we are positively thrilled to jump right in to the next five. We plan to celebrate this milestone all year long, and one of our favorite ways to celebrate is to give stuff away, so keep an eye on this blog, and our Facebook and Twitter accounts, so you don’t miss your chance to win AVL gear, free trips and more! New Airport Seating "Goes Green"
Fletcher, NC — “Our seats are in the upright and eco-friendly position,” reads a sign adjacent to the new gate hold area at Asheville Regional Airport. Last week, Asheville Regional Airport replaced its aging passenger seating with new chairs that are the first of their kind in American airports. “Our passenger seating was in need of replacement, and in our bid process, we looked at a new product that had several positive attributes,” said Lew Bleiweis, airport director. The seating, manufactured by Zoeftig and sold under the brand “inFINITE Seating System,” is made with metal replacement technology, which uses much less energy than steel manufacturing. The environmentally-friendly manufacturing process was appealing to the airport, which is working to implement a more “green” environment over time. “In addition, the product is 100% recyclable, so when the time comes to replace this seating, we won’t be adding unnecessarily to landfills,” added Bleiweis. But these chairs won’t need to be replaced any time soon. Another positive attribute of this new seating product is its longer life-span compared to other options. The seats are made of a material called “PU,” or urethane plastic, and are colored all the way through, which means the seats will not dull, scratch or fade, allowing for easier maintenance. Also, they won’t wear like traditional upholstery. Additionally, unlike traditional airport chairs that are permanently connected to one another in various configurations which makes rearranging seating patterns difficult, the new seating system is completely modular. Seats can easily be reconfigured as new needs arise, which saves money and increases efficiency. The new airport seating is one of the last installments associated with the renovation of the terminal, which opened to passengers in October 2010. Celebrating its 50th year as an economic anchor organization in the region, Asheville Regional Airport is dedicated to advocating for needed routes and competitive fares for the air travelers in Western North Carolina. To compare fares, book a trip or to learn more, visit www.flyavl.com. Fletcher, NC — Fifty years ago, Asheville Regional Airport (AVL) opened its doors and its runway, beginning commercial passenger aviation services in Western North Carolina. In the first year of service, the airport hosted approximately 50,000 departing passengers. Now, fifty years later, Asheville Regional Airport is not only celebrating its golden anniversary, but also a record high number of passengers: 369,576 passengers departed from the airport in 2010, and 366,184 passengers arrived, a 27% increase compared to 2009. Welcome, traveler! We’re so glad you’ve found your way to our new-and-improved site dedicated to helping you take the easy way out. Odds are you’ve done a little exploring and stumbled upon this blog, perhaps with the question, “What could an airport possibly have to blog about?” Truth is, we have a lot of great stuff to share—exciting news that will affect you, our beloved passenger, giveaways (everyone loves free stuff, right? ), events, and more—and this is our new favorite way to do that. But we don’t want it to be a monologue—we want to hear from you, too. If you’re on Facebook or Twitter, take a second to connect with us. If e-mail is more your style, send us a note. Or perhaps you’d rather write your message in the sky with one of those little aerobatic planes. However you choose to get in touch, know that we love hearing from you. Enough about us—we want to focus on you now. What we’d really love to do is enter you into a drawing for travel vouchers (AKA free airline tickets! ), which we can do as soon as you take a short survey and tell us what you think about us—good, bad or indifferent. We’ll get off our soapbox now, but check back soon (or better yet, add us to your favorite RSS feeds if you’re into that sort of thing) for more great stuff! Fletcher, NC – The Asheville Regional Airport Authority (ARAA) soon will welcome Mike Reisman as the new Deputy Director of Development and Operations. Reisman, who is leaving his position as the Greeley-Weld County (Colo.) Airport Manager, will begin at AVL on January 4. Reisman is a former military air traffic controller, and holds a Bachelor of Science degree in professional aeronautics with concentrations in aviation management and air traffic control technology. He has held management positions at the Richmond International Airport, the Fort Worth, Texas Department of Aviation, and most recently at the Greeley-Weld County Airport. He is a licensed pilot, a certified Aircraft Rescue Firefighter, and is professionally accredited by the American Association of Airport Executives. Reisman’s most recent accomplishments as the manager of the Greeley, Colorado-based general aviation airport helped to position the organization for continued growth. Specifically, Reisman’s development expertise lead to growth in real estate acquisitions, which doubled the campus size and resulted in a 53% growth in private development projects. In addition, the airport realized a 72% increase in airport-based aircraft, and finally, Reisman lead the efforts to construct a 10,000 foot runway – a strategic move to position the airport well into the future. Over Reisman’s 14 year tenure at the Greeley-Weld County Airport, the facility’s annual economic impact on the local community increased by over 300 percent. In addition to airport management, Reisman is avidly involved in community work, including five years of service on the Greeley, Colo. Chamber of Commerce board of Directors, and three years as chairman of the Chamber’s “Better Schools, Better Communities” committee. He previously served seven years on the Greeley Convention and Visitors Bureau Board of Directors, including as its Chairman, and is currently the immediate past-president of the Colorado Airport Operators Association. Reisman has been married to his wife Cheryl for 19 years, and they have two children: Jacob (14) and Amy (12). Fletcher, NC – Passengers traveling through the Asheville Regional Airport over the next 12 weeks will notice the newly remodeled gate area under construction once again – this time for the new concessions that will begin operations in March, 2011. 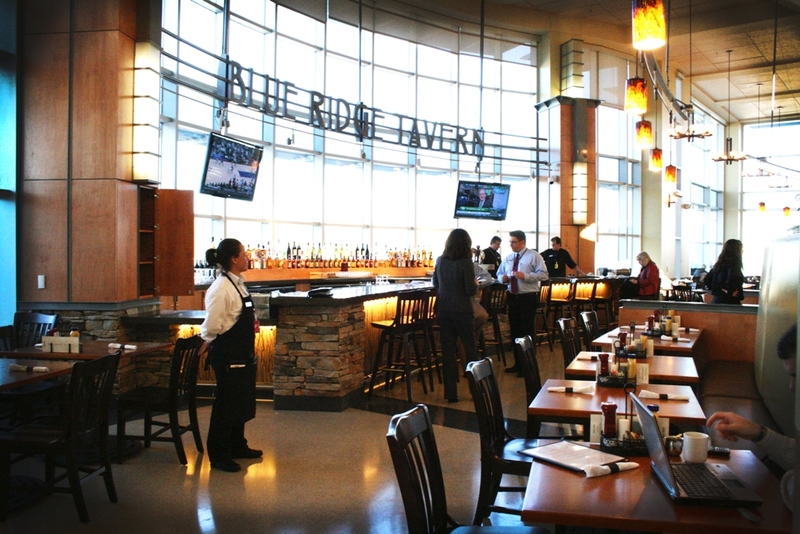 The Paradies Shops, which has been named the nation’s “Best Airport Retailer” for 15 consecutive years and has also won the title “Concessionaire with the Highest Regard for Customer Service,” will feature a post-security restaurant with a full-service bar and regional microbrews, a CNBC retail shop, and a pre-security Travelmart, featuring Bruegger’s Bagels. Construction will take place behind temporary walls in the main atrium of the new gate area (post-security) between December, 2010, and March, 2011. The project will not impact passenger travel, and all gates will remain operational and accessible to travelers. Fletcher, NC – Asheville Regional Airport Authority (ARAA) is pleased to welcome a start-up airline offering low-fare flights to Northwest Florida Regional Airport (VPS) from AVL beginning April 1, 2011. Vision Airlines, which is making its first foray into major commercial air service, plans to offer the AVL-VPS route on Sundays and Thursdays using 148-seat Boeing 737-400 jets. 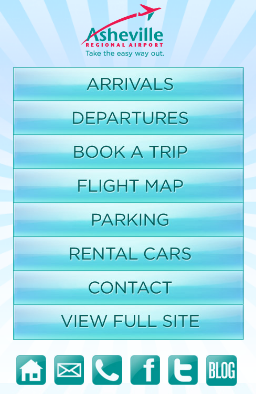 AVL currently has commercial flights to ten cities on six major airlines, with connecting service to any destination in the world. Visit www.flyavl.com for more information about AVL and visit www.visionairlines.com to book a flight to Destin.